Abz Goes Abroad: "Toto, I Have a Feeling We're Not in Wellington Anymore." "Toto, I Have a Feeling We're Not in Wellington Anymore." 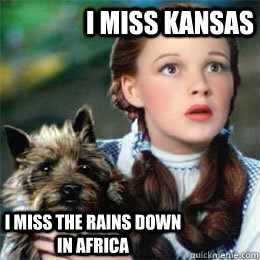 Sorry for the lame Wizard of Oz reference but I legitimately feel like Dorothy right now. I arrived in Bahrain about 8 hours ago and since then it has been a haze of unpacking, acclimatising, grocery shopping, and soaking everything in. It's not like I have never been here before - I visited Bahrain with my family in April 2014 - but everything feels significantly different. This feels more permanent than that holiday (because it is). It's a strange time when you go to the checkout to pay for your groceries and the cashier cannot speak English and has to call an English-speaking co-worker to help you instead. It also made me feel very disturbed to see individually glad-wrapped fruit in the produce section. The whole colour scheme here is beige, grey, white. Sand, dirt, sand, dirt. Everything has an Arabic translation. Road signs, packaged foods, and tv programmes. As it is winter over here, the 20C temperature is rather underwhelming in comparison to the blistering heat I experienced when I was here in April. Yet another bizarre adjustment I will have to make is the work week. Over here, you start work on Sunday and work through until Thursday. Essentially, Friday and Saturday is the middle-eastern weekend. (It's Thursday, Thursday, gotta get down on Thursday doesn't quite have the same oomph, does it?) I have tomorrow off, to get over the jet-lag, and then I have a 6am start on Monday morning. I'm so excited! P.S. They have the best dates I have ever tasted here. And a lot of weird yet delicious fruit. Good to see you are settling in. Perhaps the fruit goes off or takes longer to get to you..I noticed in Thailand that the Banana's were individually wrapped - but significantly less bruises in the wrapped parts. Is this Natasha? Your username is Gravel...fairly ambiguous. Thanks, I have been! Thanks Belynda! Yeah, I'm loving it. Lots to get used to, but it's fantastic so far.